Midwife literally means “with woman.” The care provided by midwives reflects a deep understanding of the needs of pregnant people and newborns, and the intricate healthy processes of pregnancy, labour, birth, breastfeeding and parenting. Midwives are the main caregivers to childbearing women worldwide. Registered Midwives are recognized in the medical community as experts in promoting health for both low risk mothers and babies throughout pregnancy, childbirth and postpartum. By choosing a midwife, you will have the opportunity to develop strong relationships with known caregivers who help you monitor your progress through the childbearing process. You will have access to the most current science-based options for care, as well as the oldest and most effective methods of supporting you as your family grows. We provide personalized, one-to-one visits and offer choices, resources and guidance for families to make informed decisions about their care. In British Columbia, midwives are primary care providers, free to all BC residents who hold a CareCard through the BC Medical Services Plan. We offer comprehensive medical care throughout your pregnancy, birth and for six weeks after your baby is born for both you and your newborn. We are able to order any bloodwork, ultrasounds and medications where relevant and are on call for you 24 hours a day. We work collaboratively with family doctors, obstetricians, pediatricians, nurses and other health care providers. Options for accessing complementary medicine are made available to all clients. During our prenatal appointments, we devote our attention to your priorities. Our midwives offer lengthy visits to ensure enough time to address your physical and emotional needs, sexuality, sibling and family issues, parenting concerns, and labour and postpartum preparation. You are supported in understanding your body and encouraged to actively participate in your own health care. Methods to promote health and complementary therapy options are made available for all clients. At each visit, we monitor maternal and fetal well-being using the same tools and physical exams that an obstetrician or family physician employs. While our focus is a preventative, low intervention approach, all standard procedures and screening tests are available through midwifery care. A midwife's scope of practice includes the use of many medications that may be indicated in pregnancy, birth, or the postpartum; these include medicines used during emergency situations, pain medications, as well as common prescriptions for both mother and baby. We meet with you every month until you are 28 weeks pregnant, every two-three weeks until 37 weeks and then weekly until your baby is born. Family, children and friends are welcome to join you at any point throughout your care. We believe that the environment plays a significant role in ensuring a safe, enriching experience during labour and birth. Throughout your pregnancy, we will provide you with evidence-based information regarding the safety, risks and benefits of home and hospital birth. We are pleased to offer you the choice of a planned home birth or a hospital birth at BC Women’s or Richmond Hospitals. Regardless of birth place, we offer early labour assessments at home to minimize undue disturbances to your birth. Once progressive labour is established, one of our midwives will be in constant attendance. Our collective experience includes expertise in a variety of techniques to promote comfort and progress in labour, as we carefully monitor baby and mother in the least invasive way possible. 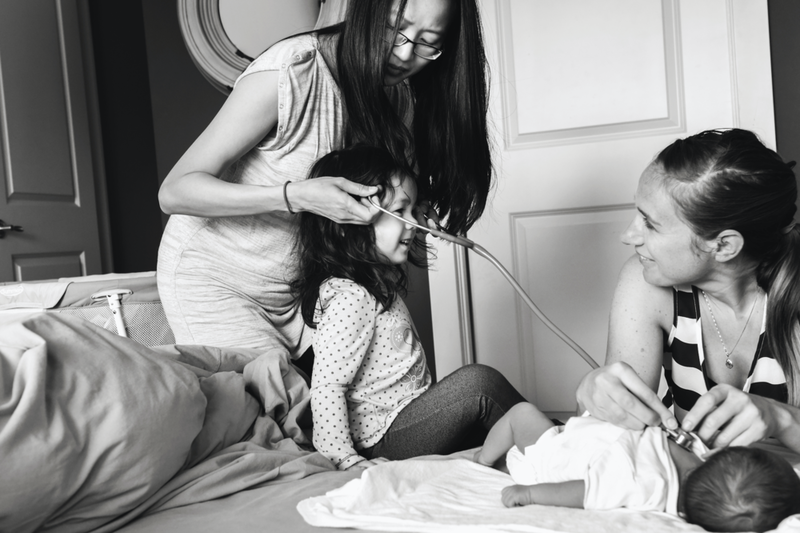 We always have at least two midwives at a planned home birth, both experienced in obstetric care and certified in neonatal resuscitation. We carry oxygen, neonatal resuscitation equipment, IV fluids and supplies, medications for postpartum use, suture and local anesthetics, and various other sterile and non-sterile supplies. Should the situation indicate a need for additional equipment or personnel, we will arrange for transfer into hospital. Once your baby is born, we provide frequent home visits in the first two weeks to help you to stay home and rest with your newborn. We will continue to provide care in our clinic to you and your baby through the first 6-8 weeks postpartum. When your midwifery care is completed you will be referred to a physician for ongoing well-baby and well-woman care. If you do not already have a primary care provider, we are able to refer you to one. Our routine postpartum care includes maternal and newborn physical exams, breastfeeding support, parenting education, psychosocial support, vaccination and contraceptive counselling. Family and friends are welcome to participate in all aspects of your care. We remain on call for you and your baby throughout this time. Like most midwifery practices in BC, we provide a clinical learning environment for student midwives and other health disciplines. Clinical faculty are the bedrock of the teaching and research efforts at the Division of Midwifery at UBC. The faculty midwives play an important role in educating new midwife practitioners, and conducting research on the promotion of health for mothers and babies. You may have the opportunity to work with a student of midwifery or another health discipline, supporting the growth of our profession. 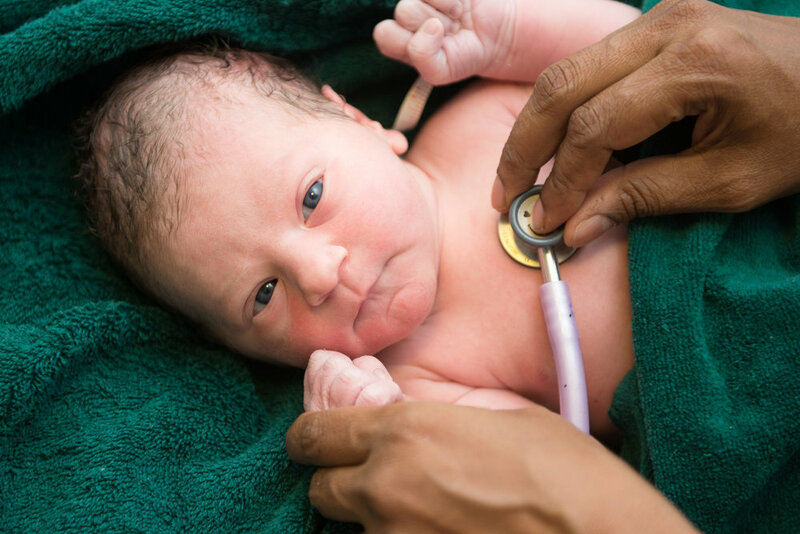 A great list of frequently asked questions and answers can be found on the Midwives Association of BC in English, Chinese, Farsi, French, Punjabi, Spanish and Arabic.